There are many reasons to love cathedral ceilings—and one big reason to temper your affection. 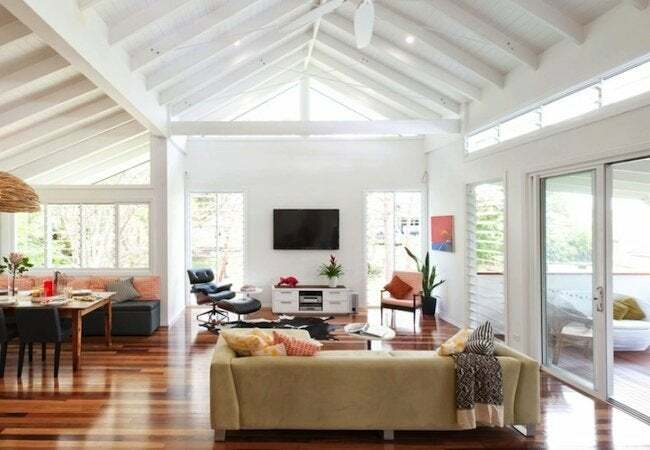 Vaulted ceilings, also called cathedral ceilings, have some great attributes, but others you may not be so fond of. On the one hand, they do give your room a light and airy feel, and they can make a small room appear bigger than it really is. But when it comes to energy efficiency, cathedral ceilings a bit of a bust, especially during the winter. That’s because air you’ve spent your money to heat ends up at the peak of the ceiling, not down where it can keep you warm (although a ceiling fan can help with that). As an energy-saving alternative, you might consider what’s called a ‘tray ceiling.’ Tray ceilings look like conventional flat ceilings, except all but the outer part of the ceiling is raised a foot or so. The reduced height of a tray ceiling can help keep your heating bills within reason, but you’ll still get some of that light-and-airy feel. Before you start cutting into collar ties, be sure to check with a contractor or structural engineer.